Another very popular all year round venue,which allows fishing virtually from your car.The 1 1/2 mile of breakwater means there`s always plenty of room.Fishing on the lower deck in to the harbour side is often more sheltered,but the fishing mirrors this.Dogs and whiting are guaranteed,and you can go for big conger against the wall.The lighthouse end is always popular and you can float fish on the inside for wrasse and mullet.Lots of other species can be taken if you hit it right. First mark is right at the start. Mackerel to feathers etc but is erratic. Sometimes loads, sometimes none. Next if you look along the top wall you will see numbers painted in white. Anywhere between 19 & 23 on the inside, especially by the double green lights, will always get doggies on an incoming tide and for an hour or so after, same with whiting. Last mark is the platform at the end. Fish from the top left corner. Do not cast, just drop your line over the edge. 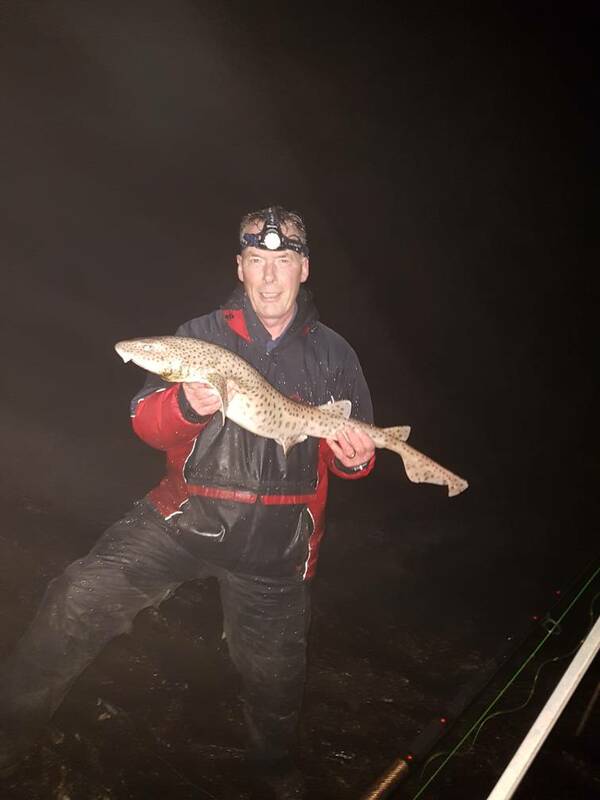 Depending on the time of year you will get wrasse, pollack, coalies, codling, pouting, whiting, strap-conger, octopuss, dabs and at night bigger conger, smoothound and bull huss. Best bait is live rag or mackerel chunks. The platform is especially good if youve got kids with you as they are guaranteed to catch something. Be aware that there are seals in the harbour and occasionally porpoises. The upper wall,fishing out to sea,is very snaggy with lots of large boulders close in.Big casting,or using the appropriate gear can make it worth the effort,though you`ll expect to lose tackle. Directions.........Enter the Island and keep on the A55 do not take any turns offs, eventually you will come to a roundabout go straight across the roundabout and then get in your left lane. Follow this road "you will see to your right side the railway and then the port " keep going along until you see a fence in front of you " you can see that the road ends" take the left turn here and now you will see a marina and things on your right hand side as you drive up this rd. When you have gone across a mini roundabout keep your eye out for the marina entrance - once you see the marina entrance there is a left turn take this turning "watch the speed bumps on this lane" follow this lane / rd until you reach a left hand bend on right hand side you will see some open gates, drive through them and just follow the track down to enter the breakwater - Just keep on driving onto the breakwater ignore the signs that say entrance blocked it is no longer blocked. The boulders are back so can no longer drive on to the breakwater.